New year, new Power Rangers Team. This time we are going to jump to Ninninger. Nope, no Toqger. Skipping the Power Rangers that run around on trains. I mean come on! That would entice a whole bunch of kids who love trains to jump onto the Power Rangers bandwagon. We have also skipped Go-Busters to get here too. So far, I am impressed with the outfits they are wearing. The helmets are really cool, with the color for the helmet, and then some metal around the faceplate. Except for White Ranger who went with the white and a touch of pink, ala Alyssa’s White Ranger in Wild Force. This time though, they have a White Ranger with a touch of pink, as well as a Pink Ranger. I am a big fan of the five member teams with two women right off the bat. In Dino Charge, we had to work our way up to a second female Ranger. The figures are standard for what we have seen before. They have somewhere around 13 points of articulation. They are not the best articulated figures in the world, but better than the current run of Star Wars figures. One advantage we get this time around is in the lady Rangers. They have split skirts that allow for lots of leg bending, so that they can do more than just stand there like every other female we have had in this style. On top of that, we get the female Rangers. In Japan, they only got the 3 male versions, and no female versions. They did get more weapons with theirs as opposed to us just getting the sword, but they never were able to complete the set. Overall, I am happy with the figures. The swords are a bit oversized, but I can live with it. The better movement in the lower half of the women is a plus. I am looking forward to getting my hands on the bad guys. I am still on the fence about the Megazord. It is sitting there in every store, next to the Rumble Tusk Megazord, which is the same Megazord with a different center figure and new plastic coloring. I don’t know if I want to open the can of worms of getting a whole pile of new Megazords. It was fun collecting the Dino Charge Zords, with all of the different dinosaurs, but to have to buy a whole new Megazord just for one small figure is pretty crazy. I don’t know how well this idea is going to work. Apparently, parents were not buying the single dino zords like they were the bigger Megazord sets. I am also going to make a hard pass on collecting the Power Stars. They look terrible, and the foam is not going to hold up over time. I think Bandai Japan had a great idea for being able to attach the Power Stars to the Megazord to make the new faces. We don’t get that here. There seems to be less to tie all of the different aspects of the toys together. In Dino Charge, the Chargers could power the Zords, as well as the blaster, swords, and auxiliary weapons. That was well planned. Not so much this time around. I was really looking forward to the Juggernaut Wave. This was a killer set of figures, with a few others that were a pass, except you need them to build Juggernaut, so I had to get them all. First on my list was a long-time love of mine. Going way back to 1989, I picked up my first two comics at a convenience store. One was Excalibur #16. On the cover is a space scene like none I had ever seen before. 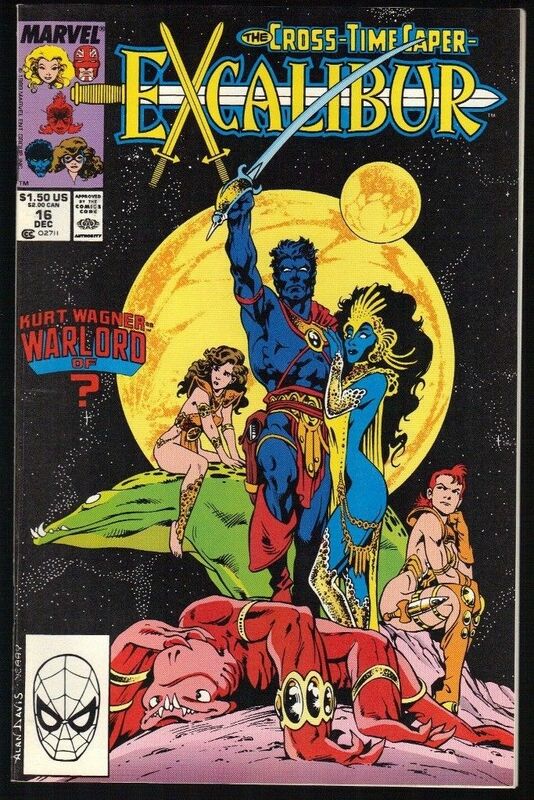 Kurt Wagner with all of his blue skin showing, along with a trio of women. One of the women was none other than Kitty Pryde, though she was in armor in this picture. In the issue there are some clothing changes, and Kitty showing her shy side while she is given a very scant outfit. Well, that was it for me. She would be forever one of my favorite Marvel characters. Now we get her in all of her plastic glory. We did see Kitty back in 2006 in the nearly impossible to find Giant-Man Series that was a Walmart Exclusive. Time passed, 10 years in fact, and we get her once again. This one blows the other Kitty away, so waiting was the right call. Kitty comes with Lockheed, her ever-faithful dragon protector and friend. He is small, cute (but not too cute), and sits on her arm. It isn’t very easy to get him to perch on her arm, nor does he want to stay there long. Kitty looks super cute. Her face is just right. Cute youth with a well done sculpt. She has some bangs added to the front, and a long ponytail in the back. 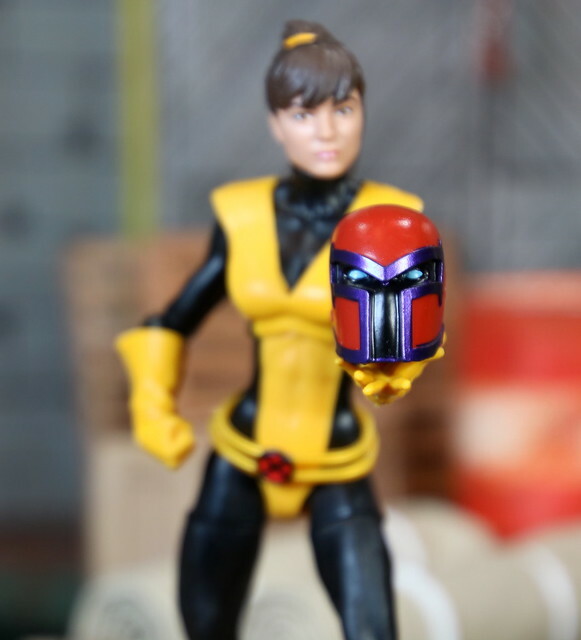 The only problem I have found with her is that her head sits a bit high on the neck, so there is a pretty big gap between her neck and the back of her head. Only a problem from the back though, so not a big deal. She comes with one other accessory in the box. For what I think is the first time, we get an accessory that goes with the previous series. Kitty comes with the helmet of Onslaught. So now you can turn Red Onslaught into Onslaught with his Magneto helmet. Boy does he look tough with that helmet on. I Hope Kitty can find some friends to help her deal with Onslaught. This is a great first character to the series. I am looking forward to getting the rest of the series opened so I can play with them. There are a few I would have skipped, but as I said before, I really want the big Juggernaut, so I had to get them. 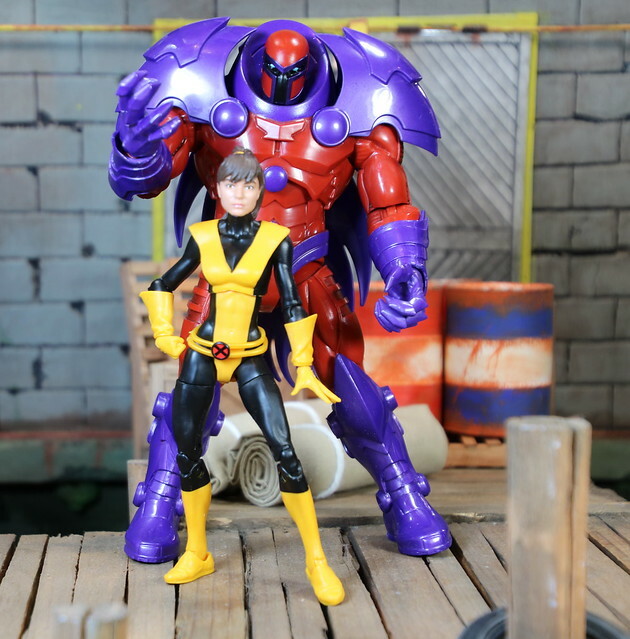 I will look at them with open eyes, and I usually like the Marvel Legends, so I am sure I will not be disappointed. Bandai had a great idea for getting this line started. Go with a simple 5 figure line. If it works, great, if not, it is not the end of the world. They did the slightly larger scale figures with the Armored Rangers line. It started with Super Megaforce, and continued with the MMPR White Ranger, and then concluded with Dino Charge. It was not a lot of figures, and it was a bit spread out. There didn’t seem to be a definite timeline for the toys coming out. I would like to know if it was a success or not. Since I found one of the Dino Charge Rangers in the secondary market at ROSS, it didn’t seem to go all that well. This line seems to be going well so far. It was a bit hard to get my hands on the MMPR figures. I ended up finding them about 50 miles from home at a Walmart when we went on a weekend trip. Now they are starting to pop up again. I wish retailers would get their acts together and get figures put out when they come in. This is a new product, so it wasn’t like they needed to get rid of old stock first. On to the Rangers. First up, the Red Ranger. This line does a good job of making strong figures, but not making them look like they are on steroids, like the Armored Ranger line. Red Ranger comes with his red and white Blade Blaster. The Blade Blaster is in blade mode, so it can be places in the holster that Jason wears. It seems like an easy thing to have created a second Blade Blaster in blaster mode. It isn’t the most effective looking weapon as the small blade. Jason also doesn’t come with his Power Sword. I heard some grumblings on the interweb that was talking about a weapons pack at some point, but I think we should have gotten the weapons right off. Depending on wether you are a bigger fan of Austin St. John’s Jason Scott Lee or Steve Cardenas’ Rocky DeSantos, you will be seeing more of both characters coming up. Both will show up in the Zeo line as the Gold Ranger and Blue Ranger, respectively. Red Ranger comes with the torso of Megazord (Dino Megazord). I can tell already that this guy is going to be great, once we get the rest of the MMPRs and their Zord parts. We are starting off with the evil Tommy Oliver. The Green Ranger is so iconic to the MMPR brand. He was brought on as a bad guy, turned good, lost his powers, and eventually became the leader of the Rangers as the white Ranger. Of course, then Jason David Frank went on to be the White Ninja Ranger, Red Zeo Ranger (V), Red Turbo Ranger, and the Black Dino Thunder Ranger. I am thinking it is a good possibility that we could more of Tommy Oliver. He will be showing up for sure in Spring 2017 as the White Ranger, and then again in late fall of 2017 when he makes a return as the Red Zeo Ranger. Tommy comes with both the Sword of Darkness and the Dragon Dagger. As long as he has the Sword of Darkness, Tommy is evil. Thankfully he came with the Dragon Dagger as well, so he doesn’t always have to carry around the Sword of Darkness and be his grumpy brooding self. Boy was he a downer when he first showed up, no matter how hard Kimberly tried to make friends. Both the Sword of Darkness and the Dragon Dagger are painted really nicely. 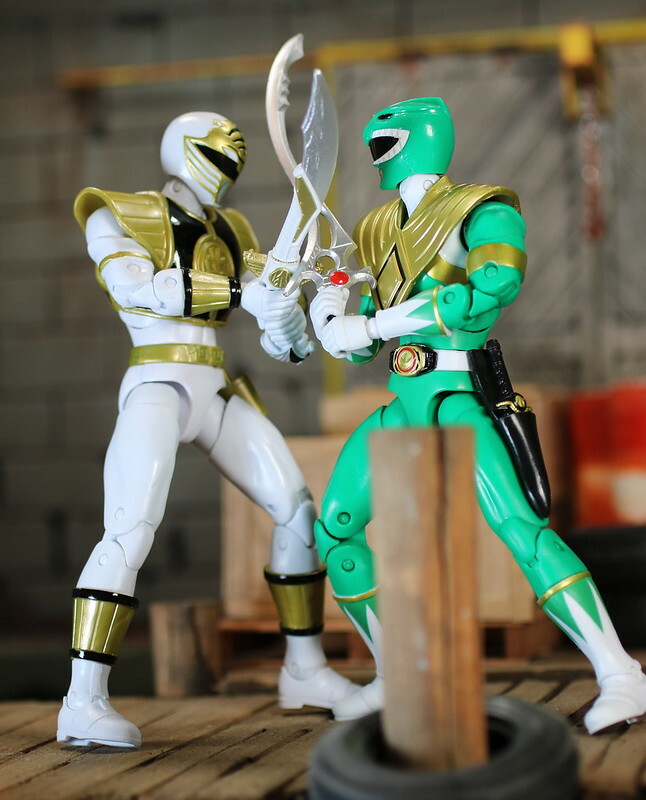 The Dragon Dagger fits into a holster on Green Ranger’s hip. With each figure I held and played with in Wave one, I became more excited for the future waves. The three Wind Rangers are really well done. They have great details, good weapons, and fantastic articulation. Adding in the MMPR to this was was was genius. All it did was wet my appetite for more MMPR figures. They are going to serve those figures slowly over the next two waves, in conjunction with the In Space figures that will cover two waves. I was underwhelmed when I first saw the Dino Drive Rangers. It was another set of Rangers with giant chest plates. This time with a giant Charger?!? I would have thought they could have made it look like the Dino Charge head logo. It grew on me, and I really like the double shoulder armor. From here we only get more armor. We started with standard Dino Charge, with one shoulder armor. Then we went to Dino Steel where we added an arm of armor. After that is Dino Drive where we take away the arm of armor, but add a chest plate and two shoulder armors. Next we are going all in with Dino Super Drive were we get spiky armor all over the place. When will we see DSD on the shelves? Probably around the time that Dino Super Drive returns after the spring hiatus. For now we have more Rangers than you can shake a stick at. Speaking of so many Rangers. 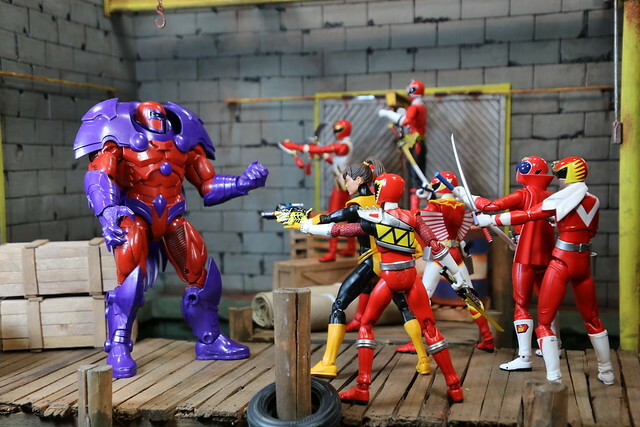 We now have 4 versions of Red Ranger, including the T-Rex Super Charge. Do you think they will go all in and give us the Super Charge formations? He has four of them, so we could get a whole wave of variant Tylers here in the near future.